Wow, this post is sorely late! 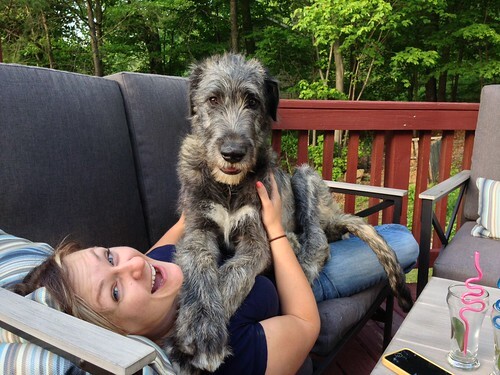 As those of you who are my Facebook friends are probably SO SICK of hearing about, we finally brought home a sweet Irish Wolfhound puppy in mid-April. He is an absolute joy! I've had dogs since 2001, and almost every day I think to myself, 'I didn't know a dog could be this good!' He really is a gentle giant. Grimmauld (Grimm) is a perfect fit for our family. I have wanted a pup of this breed for years, but never thought that I could make it work. Because of their enormity (they are the largest/tallest breed) I had specific criteria that I wanted met before we would bring one into our home - a single family/detached house, property, no kids, no other pets, a willing spouse. Pretty specific, and I never thought that the stars would align and we would be childless in a SF home out in the country, and that both of our other dogs would pass within just a few weeks of one another! After applying for a rescue and making ourselves know within the local IW community, we were recommended to a breeder in Michigan who had this little guy. He had an FCE (basically a stroke in the spine) as a puppy that cause temporary paralysis of his back legs. He was standing on his own again within a week, which is unheard of, and he has continued to improve every since. His gait is still slightly wonky, so he can't be shown, which is how he came to live with us. We had no interest in showing or breeding, nor in having multiple dogs in the house, and the breeder wanted the right home for him. I'm glad she thought that was us! After a home inspection/site visit to make sure we were prepared for a dog this size, we were approved, and the following weekend we hopped in the car to drive to Michigan to pick up our new baby (public photo album here: https://www.facebook.com/media/set/?set=a.10152087386437005.1073741834.731562004&type=1&l=df4910b0b8). He's been with us for almost two months now, and has grown SO MUCH, gaining about 5 pounds a week! Here are just a few photos to show his growth. And to think, he has much more growing to do still! HUGE paws (that's my fist)! And all of a sudden, he's no longer a puppy! He's our big boy and we love him to pieces! Thank you for indulging me in bragging on our sweet Grimmers! Grimm is adorable! Hard to believe he is growing so fast. Our daughter has a English Mastiff. I thought Emma was huge. Emma is definitely a gentle giant just as I am sure Grimm is as well. Enjoy your 'little' boy. LOL Thanks for sharing the pictures of him. Love his sweet wiry-haired face! He looks so snugglable (new word?). Mandy, he looks like he has a very laid back personality. I grew up with a German Shepard, a 130 pound lab, and a Great Dane that were allowed in the house. (my parents loved animals, obviously) It was amazing how the Great Dane would walk around like he was in a china shop so he did not disturb anything. Bigger dogs are definitely sweet, considerate and protective. I laughed when you posted the very first pictures of him thinking that if that dog ever grows into his feet, they may just have to add on to their house!!! So glad you are enjoying him and Grimm looks like he knows he's got it made in the shade! He is SUPER laid-back. Because of his size, he actually sleeps and chills in the house most of the day, and because of his rapid growth, we actually aren't even supposed to exercise him too much. He's such a lovey! And yes, totally snugglable ! I never tire of seeing Grimm! I adore him! We stopped by the vet on Saturday morning to schedule his neutering surgery and to weigh him on their big scale. He's right on track, gaining about 5 pounds a week. At his last appointment on May 15th, he weighed 83 pounds, and on Saturday he was up to 103.5. We just love our big (and getting so much bigger) boy! I just LOVE him! The one with him resting on the couch AND the ottoman made me lol. He's such a cutie! Oh, thank you Shelly! You're too sweet.